Headfort is set in part of the former Headfort Estate on the outskirts of the heritage town of Kells. In the 8th century, the most important religious manuscript, The Book of Kells, was housed in the nearby monastery where it remained safe for 200 years. In 1007, disaster struck when the book was stolen, though thankfully, the priceless manuscript, containing illustrations and transcriptions of the four Gospels, was recovered. It is now kept locked away in Trinity College, Dublin. 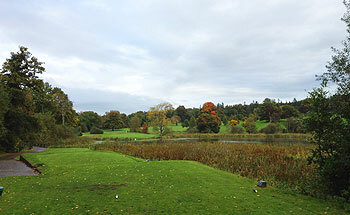 The Headfort Golf Club was established in 1928 and it's a mere youngster compared with the Book of Kells. The original course, now called the Old, quickly developed into a fine but subtle parkland test. In 1998, the club purchased a piece of adjoining land stretching beyond the River Blackwater and they commissioned one of Ireland's all-time favourite golfers, Christy O'Connor Jnr., to design a second course, which opened for play in 2001 to rave reviews. The New course is a layout that harmonises with the land but, at the same time, has a modern feel. It makes maximum use of its fine trees and natural undulating features - there is also water aplenty and numerous strategically placed bunkers. Although the Old course has hosted PGA Championships, the New course is the tougher of the two, measuring more than 7,000 yards from the back tees. The SSS of 75 says it all. Headfort is set quite beautifully and is renowned for its majestic native trees. Thanks to the Headfort family and their horticultural expertise, this really is a charming walk in the park. Visited Headfort for the second time in late June with a golf society. I organised the trip in a hurry based on such a good experience there on a dirty, wet day there in April. On this occasion, the sun split the trees and I have to wholeheartedly agree with earlier reviewers that that this is good a parkland experience as you're likely to enjoy in Ireland. And amazingly, at less than €30 a head, on a Sunday morning, with society rates. The course is simply a pleasure and I cannot think of a single weak hole, while numbers 1, 3, 4, 6, 7, 9, 11, 17 and 18 could all end up in a "best of" scrapbook. The shortish par fours at 3 and 10 in particular stay in my memory, with just the right mix of water and trees to make you really think about what you're doing. The course was also in great condition, with fine fairways, occasionally punitive rough, and very consistent greens - if a tad on the slow side, which I have to say I prefer. Some of the tee boxes looked as though they could do with a bit of work, but seeing as we haven't had a spell of weather like this in Ireland in a decade, I imagine they're getting more damage than they're used to. But when you're walking through hundreds of acres of forest and lake, with views to die for and a tranquility so rare, it seems unnecessary apart from matters of balance to mention such trivial things. We ate in the clubhouse and the food was both excellent and reasonably priced, while the staff and members were generally friendly and welcoming. All told, I couldn't recommend this place enough. I'll revisit before the end of the year to see how the also highly-rated Old Course stands up. After playing this course for a second time, this is without doubt the best parkland course ive ever played. I posted a review here of my first time playing the course and although the majority of what i said i still stick by, the 18th is far from a weak finishing hole as i commented previously. The last time I played the course I had already played Headfort Old on the same day so i was absolutly knackered walking up the 18th on the New Course so after playing it again, my opinion now is the 18th is a very strong finishing hole indeed. I dont know what i was thinking!! Since my first review of the course ive played other highly regarded parkland courses such as the PGA National, Concra Wood and the K Club (Palmer) and neither of them come close to Headfort New in my humble opinion. The opening 12 or so holes are extremely strong and every one of them could be signature holes if they were on another course. Again as I stated before, the stretch of 13, 14, 15, and 16 dont get the heart racing like the holes before it because they are on open ground without the mature trees that have been constant up until this point. They are far from weak holes but there is a different feel to them due to the open nature of the ground they are on and the perfection of holes that have preceeded them. Long may this course slip under the radar. Cannot wait to play it again. played this course only 2 days ago and went with the offer displayed on their website "both the old and the new course on the same day - 70 euro". we started off on the old course and even though it is a decent course, there are very few holes that stood out - the par 4 9th being the pick of the bunch for sure. we entered the clubhouse at lunchtime and after eating a lovely meal in a lovely restaurant we headed across the road to the new course. Instantly we all agreed that this course oozed class. It was immaculately manicured with the greens, fairways, bunkers and even the rough maintained to a very high standard. Almost every hole was an absolute gem and the water features (which were present on most holes) were visually stunning and asked a few questions of the golfer and their choice of club. The front nice is very close to perfection. Every single hole sticks in the mind and it leaves you questioning how on earth there can be a better parkland course than this in this small country of ours. The back nine starts off very strong with 10, 11, and 12 but I just felt that the next few holes lacked character. It was the only thing that let the course down but with such good holes gone before us it was virtually impossible to maintain such a high standard. Hole 17 is a great little par three across the river but the 18th was disappointing as a finishing hole. All in all it is a very very good course and well worth the visit. I drove from 40 miles away to play here and in truth I would have driven another 40 miles in a heartbeat to play a course this good. Played many parkland course in the Dublin area but this is infinitely better. Not only does (nearly) every hole stick in your mind after your round, but every shot as well. Must play course for sure. This is without doubt the best inland course I have ever played - actually played this course a week after I played the K Club - myself and my playing partner agreed Headfort New was even better than K Club. 18 wonderful holes of golf and what a friendly Clubhouse to relax in afterwards, and most importantly, fantastic food. Looking forward to playing 2-3 times during 2008. Excellent Course - superb use of natural terrain to produce a Course that belies its 4 years of existence. A must-play course for golfers wishing a challenging but rewarding layout!! A Course which is definitely good enough to host an Irish Open! A fabulous golf course, difficult to remember a weak hole. A serious but fair test of golf in magnificent surrounds! !